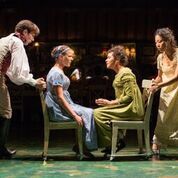 And be wise.... don't miss Folger Theatre's latest offering, the new stage adaptation of Jane Austen's novel 'Sense and Sensibility' - actually her first published book. The super-energetic production conceived by New York's Bedlam Theater plays through the end of October (2016). Furniture moves around on wheels. Actors play several roles, even sometimes within the same scene. Scenes of tears and joy. Madcap characters and misunderstood emotions. An entirely different take on British gentry you won't see anywhere else, the very opposite of 'Downton Abbey' and sure to influence future takes of other of her literary creations. The connection between this most beloved author and Shakespeare is not as far-fetched as you might imagine, though some 200 years separates the two. Folger Shakespeare Library is celebrating them both with a comprehensive exhibit to honor Austen's 200th anniversary coming up in 2017. See: 'Will & Jane: Shakespeare, Austen, and the Cult of Celebrity' that will remain long after the Bedlam production has gone. Some thoughts: The meaning of 'sensibility' refers not to common sense but to the capacity for being sensitive. Two of the three sisters involved in the mating game represent two quite opposite personalities characterized by those words. Director Eric Tucker calls the play 'actor driven' for good reason. It's difficult to ever take your eyes off them. And while the staging is modern in concept, settings and costumes are definitely of the period (the book was published in 1811). Speaking to Folger supporters one evening, he pointed out ice advantage that theater of this kind offers in contrast to TV and film - 'boundaries can be stretched and even broken.' Compelling stories remain the same, however: 'it's all about relationships and people, gossip and changing lives." Notice! tiny little wheels on the legs of the chairs.